2006 Honda Shadow 125. Picture credits - Honda. Submit more pictures. The fun and friendly Shadow 125 is the most full featured and satisfying American Classic cruiser in the entire 125cc class. With the looks, styling and proportions of a larger machine, its light and comfortable feel gives riders of all experience levels greater ease and confidence on the move to maximise riding enjoyment. Its low saddle-type seat, wide pull-back bars and forward-mounted pegs provide a comfortably laid-back riding position and a delightfully easy reach to the ground. Ask questions Join the 06 Honda Shadow 125 discussion group or the general Honda discussion group. Get a list of related motorbikes before you buy this Honda. Inspect technical data. Look at photos. Read the riders' comments at the bike's discussion group. And check out the bike's reliability, repair costs, etc. 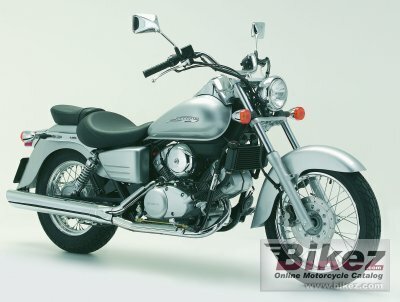 Show any 2006 Honda Shadow 125 for sale on our Bikez.biz Motorcycle Classifieds. You can also sign up for e-mail notification when such bikes are advertised in the future. And advertise your old MC for sale. Our efficient ads are free. You are also welcome to read and submit motorcycle reviews.